A successful outcome is dependent on adopting and maintaining a healthy lifestyle. Every person considering bariatric surgery must thoroughly understand the consequences and weigh the decision very carefully. Bariatric surgery refers to any surgical procedure that makes changes to the stomach or intestines that induce weight loss. There are several types of surgery that achieve that goal by different means: by restricting the amount of food the stomach can hold or by restricting the nutrients than can be absorbed or a combination of the two. 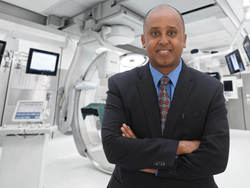 “Deciding whether you're eligible for surgery and which procedure is right for you is based on several factors and is determined in consultation with a bariatric surgeon,” says Dr. Ahmed. Am I ready for bariatric surgery? Are you healthy enough? Conditions such as heart problems and liver disease may increase the risks of surgery or be made worse. You will have a comprehensive physical exam and lab tests to determine eligibility. Are you willing and able to make – and maintain – the lifestyle changes recommended by your medical team? In particular, you will be on a restricted, staged diet after surgery and your eating habits will be permanently changed. Are you fully informed about the risks and benefits of surgery? About pre- and post-surgical procedures? About follow-up care? Do you have the help you'll need at home after surgery and the support to maintain diet and exercise regimens? Mustafa Ahmed, MD, FACS, is board certified in surgery, surgical critical care and internal medicine. He is an obesity expert, bariatric surgeon and medical weight loss management specialist and the founder of Southern Nevada Bariatrics.